The Unknown Tongues know they're home when they smell saltmarsh and see woodlands give way to bays, creeks, sounds, and shoals. Coastal North Carolina is flat, but you still get lost in it. The roads twist from village to village past gnarled oaks and fishermen's homes, with their great piles of crabpots, webs of nets, and skiffs under various stages of construction in side yards. 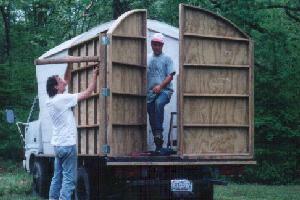 Band leader Bryan Blake has built wooden work boats and skipjacks in Gloucester since 1978 (see Blake Boatworks). He apprenticed with the old timers of Harkers Island, learning the vanishing craft of wooden boat building. When the love of Cajun music struck him like a plank to the head, Bryan dug his fiddle out of the closet, set the neck, fixed the bridge, and began learning swampy old tunes. Barbara wasn't sure what to make of Bryan's new passion. But who could deny it? Bryan fashioned her a triangle out of the handle of a tire jack and she figured, "if you can't beat ‘em...". 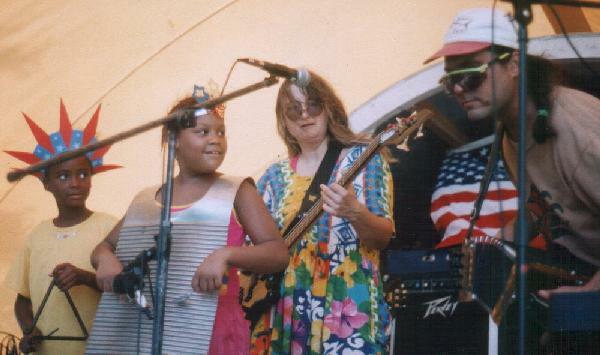 The Blakes started a monthly jam in 1989, the year their son Aren was born, and musicians came out of the woodwork. 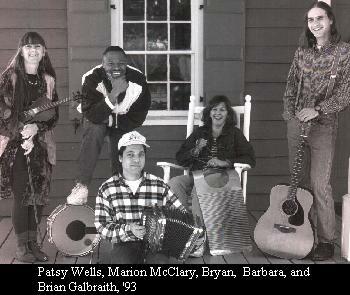 Patsy Wells, who used to live in Baton Rouge, shared Bryan's love of Cajun fiddle, and they worked up heartbreaking twin fiddle tunes. Derby Daniels of Davis Shore brought his guitar and dobro talents, and a good head for learning French lyrics. His wife JoAnn played rhythm guitar and kept everyone organized with her songlists. After their 1990 debut at the Beaufort Music Festival, the Unknown Tongues made the pig-pickin' and charcoal mullet circuit, ritual gatherings of eastern Carolina. Two-steps and waltzes were familiar to folks. 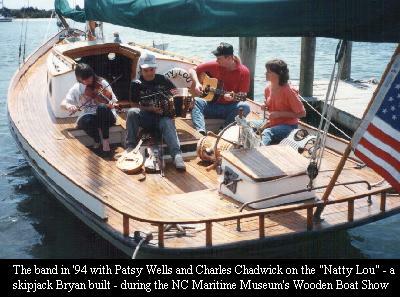 Old-timers remembered sailing out to Cape Lookout for a pavillion square dance - had them on Ocracoke, too. And the local similarity to southwest Louisiana is more than deep family roots, hard workers, and surviving in a flat, hurricane-prone environment. There's been a pipeline of people since the 1950s from Beaufort to Dulac, Lousiana with the menhaden fishery. To this day, crews of black and white Tarheels kiss their families goodbye in April, and head for the Gulf until mid October. "Chank-a-chank music? Oh yeah, we know that." Every February folks look forward to the Unknown Tongues' Mardi Gras festival. No grants, no sponsors, no price of admission - it's all "donate what you can, eat all you can." Gloucester Mardi Gras began as a thank you to fans and friends who kept the Tongues afloat. Last year some five hundred people came through, eating fried turkey and gumbo, dancing, making masks, and helping out. There is nothing else like it in North Carolina, but it feels like we're coming home to something we should've been doing all along. The band evolves with every new musician and instrument. After Bryan wrapped himself around the button accordion and Barbara suited up with a rubboard, it seemed time to go electric with drums and all. Drummer Marion McClary was pivotal in cranking things up to the entrancing groove of Zydeco, until leaving to study the lobster's sense of smell (!?!). Then came the Gen X boys who decided Louisiana roots music was truly alternative - Todd Humphreys played bass when not wandering the world, and Brian Galbraith played guitar before moving to Maine to - guess what? build wooden boats. Charles Chadwick played with the band too, and recorded their first album - "Still Unknown" - before moving to Nashville and starting his own recording business. 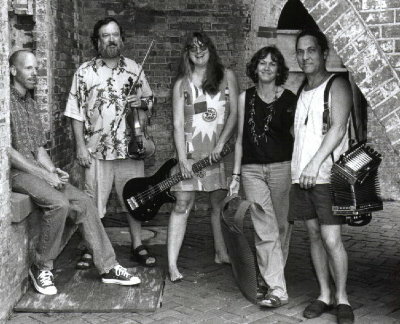 Recording artists Bill and Libby Hicks played in the band for six years, until going their own way in 2001. Libby's guitar and keyboard brought a new beauty to the music, and she became a great zydeco bass player too. Fiddlin' Bill did just that, always wowing the crowd, and developed a thang for electric twang-style guitar. Drummer Scott Kucera took over where Marion left off, and now Syracuse native Tom Parker, who has toured the world with the likes of Blues artist Cary Bell, keeps the beat for the Tongues. Bryan infused a new energy into the music with his new accordion in "D", and is exploring the mysteries of the pedal steel for them "belly rubbing" songs. 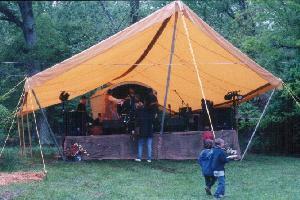 The latest addition to the band is Bryan's homemade Gypsy Wagon foldout stage with winged tarp, dubbed the "Cajun Pagoda" by tarp afficianados. Band in a can - before... ...and after!